Colin Stewart and Allan Cameron Harley were the proprietors of The Sun Foundry, Adelaide. Originally from Glasgow, the two set up The Sun Foundry to supply the evergrowing market for their craft in 19th century, Australia. Their designs represent a “gracious era” where people took time to produce high quality and long lasting decorative items. 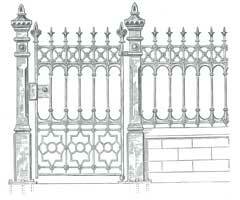 After years of careful research and development, we have developed a unique collection of 19th century, Victorian Era inspired cast iron railings and gates. Using traditional foundry methods and techniques, the patterns faithfully replicate those found in the original Sun Foundry catalogue of 1897. Created from totally authentic designs and high quality materials, the Heritage Cast Iron USA Collection is perfect for traditional new construction, restoration and regeneration projects and provides an enduring, traditional alternative to the multitude of lightweight railings and gates currently offered in the marketplace. Common applications include residential garden and driveway gates, fences and railings, institutional, government and religious fencing, and cemetery fence and gates. Crafted in solid cast iron using time-honoured techniques, the range represents the finest quality decorative cast iron available today, just as it was offered 100 plus years ago. The Heritage Cast Iron USA Collection has also been developed with modern requirements in mind, allowing the use of integrated automation systems. All railings, gates and posts are supplied primed and undercoated, ready for application of the final coating after installation.